Looking for body powder without fragrance or talc? Look no further! We know how hard it is to find, so we developed one with a nice silky texture. 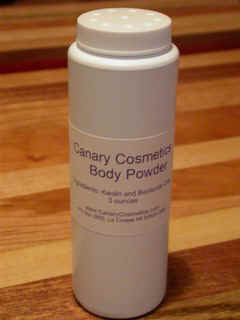 Canary Cosmetics Body Powder Ingredients: kaolin and bentonite clays. Nothing else. Contains no talc, no animal products, no fragrances. Never tested on animals. 3 oz. net weight, in a shaker bottle.